The Magnolia Suite is named after the magnificent Magnolia trees on the property and found throughout Middle Tennessee. Their bold blossoms and lustrous leaves embody the elegant grandeur of this master suite. This second-floor suite starts in your very own parlor complete with seating around a grand fireplace surrounded by other antiques and collectibles. To the right of the parlor is the original spacious master bedroom with fireplace and a King sized bed nestled into the angular windows of the front facade providing natural light from three angles. The suite is filled with Victorian furnishings covered in Italian silk brocade. 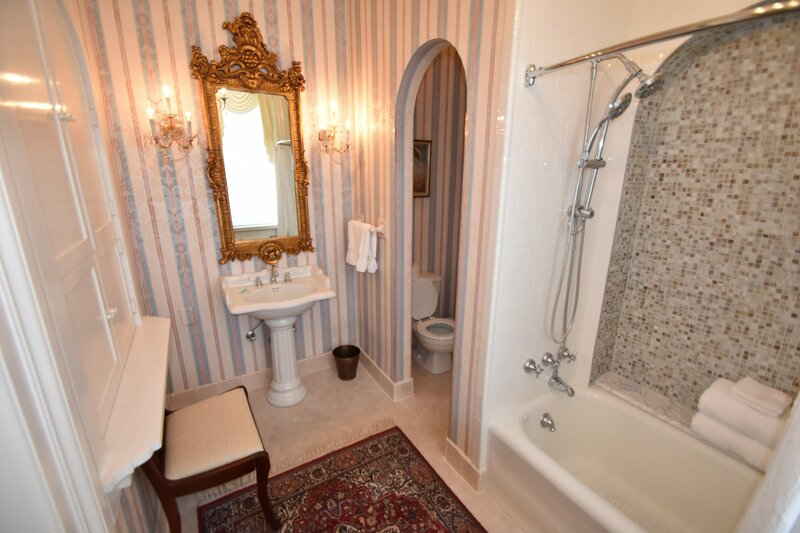 To the left of the parlor is the bathroom for this suite complete with crystal chandelier, tub/shower, and built-in dressing table.